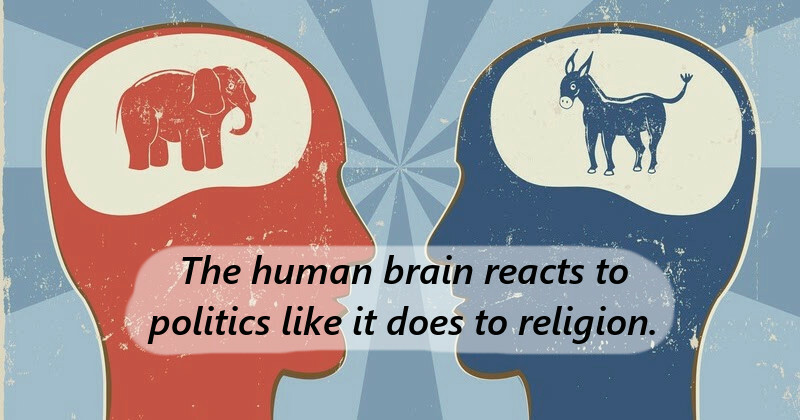 A recent California State University (CSU) study determined that the brain behavior of people when encountering arguments for opposing political beliefs to be similar opposing religious beliefs. This study is further evidence to what many people have long-since suspected: that people endorse politics in a very religious manner. In the study 40 self-described liberals were presented with statements on political and non-political positions and told to rate their view on each position. Then counter-arguments were presented and they were again asked to rate how they now view their original position. At each stage they had their brains scanned through an MRI machine. For political positions their positions, and brain patterns did not change much before or after opposing arguments. But for non-political positions, such as “Thomas Edison invented the light-bulb”, participants showed more evidence of doubt, which was also shown in the brain scans.